Justin Allgaier dominated June’s Iowa 250 presented by Enogen but had to hold off a hard-charging Christopher Bell for the victory at Iowa Speedway. 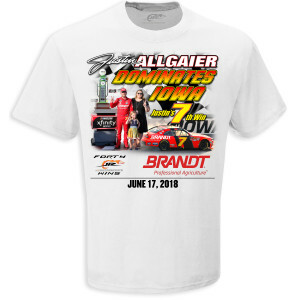 Allgaier swept all three stages on the day for the race win and his second NASCAR Xfinity Series victory in 2018. Commemorate his victory with a collectible race win t-shirt.